You are planning your trip to Amalfi and there are several questions and doubts about how one of the most beautiful corners of the world works: don’t worry, here a practical guide to Amalfi to help you, your Amalfi Survival Guide! If you have never been to the Amalfi Coast, it is normal not to be able to understand how this unique ecosystem works, enclosed between cliffs and crystal clear sea water. From the choice of the best location to stay, to transport, trips and excursions to do, places to avoid and places to go to … there are many things to consider for a successful holiday on the Amalfi Coast. Follow all the steps of our practical Amalfi Survival Guide and you can’t go far wrong! Hi Daniela, how do I get to Amalfi? Should I come by car? I hear that the traffic is awful! – In high season it is certainly recommended to avoid the car if you are not familiar with the place and trust the excellent services of public and private transport available on arrival to move between the various cities once here. If you travel by car it is important to book a parking lot well in advance, this will allow you to have a discounted daily rate and thus a less expensive rate per hour. Hotel receptionists are always available to find the best solution. Have confidence! The same applies if you don’t travel by car and arrive by train or plane. The nearest airport to the Amalfi Coast is Naples-Capodichino, the nearest railway station is Salerno. Book your transfer from the airport or train station well in advance. We strongly advise do not take a taxi without having agreed a price for the journey beforehand. Trust hotel receptionists and transport companies that accept online reservations. Once arrived in the Amalfi Coast, to move between the various villages we have a great service of public transport, buses and boats and finally it’s a time to relax enjoying the stay. – Where to sleep in Amalfi is very personal, the most of the hotels that you will find in the city are generally family-run and they are ready to welcome you at the first moment trying to meet all of your needs. The decision depends on what level of comfort you are looking for. For example, among our stay proposals we have the Aurora Hotel which offers a location near the beach with a panoramic view of Amalfi. Without forgetting the possibility of parking on site! On the other hand, if the plus you are looking for is to have a travel experience like a true local you can live in the privacy of an apartment in a historic building in the centre and the Aurora Residence with self-catering apartments is the best solution. In Amalfi you can find a bit of everything, depending on what you are looking for! What are the things to do first in Amalfi, do you have any advice? – Well if you come to Amalfi you must not miss the lemon grove of Salvatore Aceto and try all of his local products, and visit the farm Fore Porta immersed in the UNESCO oasis of the Valle delle Ferriere recently reviewed by Forbes. Then a guided tour of the historic centre would be advisable to appreciate all the nuances of this maritime city (our hotel offers a tour free on some days of the week), and why not a nice boat ride to see the view from another perspective, the best! And for lovers of activity, don’t forget the walking tours provided every day of the week except Sunday. Do you have advice on where to eat in Amalfi? – In Amalfi the quality of the restaurant ranges from medium to high. From the starred restaurant to the trattorias where we locals love to dine and relax after a long day. The Aurora lists top-level, mid-range restaurants and classic trattorias. Ask at our reception once here, we are at your disposal to advise better choice. Is Amalfi a safe city or should I worry about something? 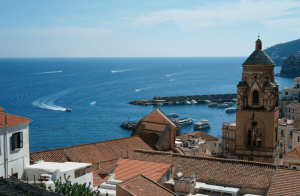 – Amalfi is an incredibly safe city! Definitely suitable for all solo travelers! The locals are very friendly and protective! For sure you must be a little more careful when you go to Pompeii or Naples for an excursion. How much in advance should I book my trip to Amalfi and the different activities I want to do? – Regarding hotels, parking or transfers, dinner in a starred restaurant, visit to the Pompeii ruins, I recommend to book 3 months before at least. For all other activities, ask at the reception desk on arrival. Now we are all social, what are the most Instagrammable photos of Amalfi and surroundings? – For your Instagram I definitely recommend the Furore Fiord to visit with a rental boat or a rubber boat, the Cathedral of Amalfi, Ravello and its Villas, and Positano! Thanks Daniela for all the useful advice and this practical guide to Amalfi! If you also want to contact her and ask questions, or book a room at her Hotel Aurora Amalfi, write to info@aurora-hotel.it and check room availability on the Official Website, where you will always find the best rates available online. See you soon in Amalfi!